As in many communities across the country, we turn to our local radio and TV stations for news, weather, and sports. But often, our relationship with local media personalities goes deeper than that. After welcoming the same DJs, anchors, and reporters into our homes day after day, we think of them as trusted friends. We rely on them not only to keep us informed, but to entertain and advise, to steer us in the direction of all the best our community has to offer. So it made sense to turn to local media personalities to help spread my library’s message. I work as the marketing and communications director at Capital Area District Libraries (CADL) in Lansing. Our goal is to make the phrase “I didn’t know the library had that!” as obsolete as a floppy disk. Early in 2014, as we prepared to kick off both a millage renewal campaign and our annual Summer Reading initiative, it was especially important to communicate with residents in our service area. My marketing team came up with a number of ways to turn local media outlets—already recognized and trusted in our community—into library advocates. The payoff? An amazing $75,000 worth of free media coverage over an 8-month period. In 2010, CADL received a grant from the Lansing Public Media Center to purchase video recording and editing equipment. Staffers learned to produce simple content for the local access channel, including book reviews and demonstrations of kids’ crafts. 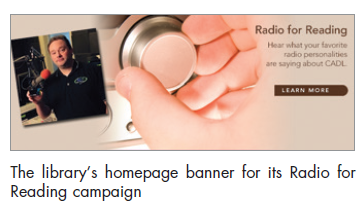 In 2014, we took our production skills to the next level with a campaign called Radio for Reading. Our idea was to visit local radio stations and get footage of popular personalities promoting library services such as downloadable books and our music collection. This would be a way of connecting to radio audiences that would break some of the stereotypes about libraries. Our online/PR coordinator and desktop specialist would also use this footage to create TV spots. Recognizing a good opportunity to get their DJs in front of a large viewing audience, the radio station managers came onboard readily. We began incorporating the spots into our regular paid TV schedule (see tip #4 in the sidebar on p. 5). Since we don’t have a huge advertising budget, we worked out a scheduling strategy that would yield strong ratings among our target audience (females aged 18–54). We chose to place our ads in local morning newscasts, as well as during TODAY and Good Morning America. Once the spots started airing, the featured radio personalities talked about them on their own shows and posted them on station websites and blogs. (See the spots at tinyurl.com/ppcogkx. ) It was exciting for library staff to hear listeners calling in to the stations, sharing that they had seen the library ads on TV. In addition to the exposure CADL got on both radio and television, we maximized usage of the ads by sharing them on our own Facebook, Twitter, and YouTube (youtube.com/cadlvideos) accounts. We also created special website banners featuring the personalities. CADL is fortunate to enjoy generous support from our local television stations. Throughout the summer, the area’s top two stations—WLNS TV 6 and WILX TV 10—ran free spots that featured their news anchors promoting our Summer Reading program (tinyurl.com/mkva4le). The stations donated the production of these spots and aired them regularly. Free announcements for Summer Reading also appeared on WKAR, our local PBS station. As with the radio spots, we got the most out of the TV ads by posting them on our YouTube channel and drawing attention to them with special “Breaking News” web banners on our homepage. We also shared them through social media. In addition to the free Summer Reading spots, WLNS also provided us with free online ads and space on its website (tinyurl.com/nzan2b3). Now that summer is over, we continue to use the space to feature library events and book reviews from our staff. A feed from our Twitter account also appears on the site. As pervasive as radio, TV, and the internet have become, a segment of the population still relies heavily on print for its news and entertainment. In the Greater Lansing area, residents have free access to seven weekly newspapers, each tailored to a specific community. For the past 5 years, CADL has had a regular presence in these publications. Rather than paying for ad space, we worked out an agreement with the publisher to provide the papers with fresh content every week in the form of columns written by library staff, often accompanied by full-color photos. So when it came time to promote both our millage renewal campaign and our Summer Reading program this year, we were able to avoid the appearance of suddenly needing to connect with newspaper readers. They were already used to seeing articles about their local branches, often written by staffers they knew personally. Our strategy was simply to make Summer Reading and library value the topics of our columns for several months, along with election reminders. 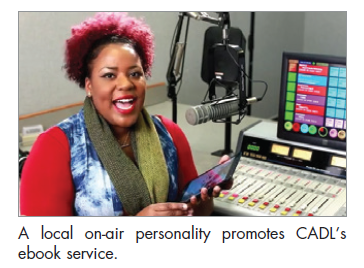 With the Radio for Reading campaign, the free Summer Reading radio and TV spots, and the community newspaper columns all in play, CADL enjoyed a major media presence from June through August 2014. This helped us post a 9% increase in Summer Reading sign-ups and a whopping 27% increase in program attendance over the same period in 2013. Patron surveys and social media interactions pointed to our media campaigns as being partially responsible for these increases. The timing of the media blitz also helped position our millage renewal campaign, since the vote took place in August. The renewal passed with 77% of the vote, the highest percentage in our 15-year history and a six-point increase over the 2010 results. While we have no way to measure the direct impact of our media exposure on the election, we do know that it increased the overall reach and frequency of all our media messages. In addition to those results, we found that positive feedback and library service usage both increased during the campaign. We also found that once we had positioned the radio personalities as library advocates, station managers wanted to increase their level of support. For example, Townsquare Media Lansing, which operates six radio stations in our service area, has since become a very strong advocate for CADL. It has provided us with a large number of free promo spots. While many librarians routinely submit press releases, request coverage, and sometimes partner with the media, the approach that our team developed works better. Rather than focusing on getting our information to the public, we have worked to transform local media outlets into library advocates. Of course, media outlets must maintain journalistic integrity, and there will be times when their coverage of the library may be unfavorable. But overall, they have embraced the idea that supporting CADL’s efforts is a great way to support their own readers, listeners, and viewers. Our long-term goal at CADL is to be sure that everyone in our community is aware of the services we offer. We believe that one of the best ways to achieve this is to build a network of media and community outlets that allows us push out content and engage citizens. While CADL is one of the largest systems in Michigan, we believe that libraries of any size can follow our example on some level. The goal is to create strong ties with local media and then leverage those relationships to the advantage of everyone involved. Here are some tips to help you start doing what we’ve done. 1. Assess your strengths. While libraries are worthy of media support, so are hundreds of other organizations. Identify one or two areas in which your library excels and present them in a way that will appeal to both the editorial and business sides of the media. In our case, with 13 locations across the county, CADL offers 13 different marketing channels. The giant footprint we have in our community is one of our greatest strengths. 2. Choose partners with a similar mission. Be sure the media partners you approach either share a similar mission or are part of the overall lifestyle of your patrons/potential patrons. Libraries are a trusted and respected brand, which is a valuable commodity to media outlets that are trying to establish the same kind of image. 3. Make your pitch, then negotiate. Normally, the first point of contact with a media outlet is a salesperson or account executive, so it’s essential that you take on a salesperson’s mind-set yourself. Be ready to sell them on why they should help you. Negotiate ways that this arrangement will benefit both of you. While it’s not good practice to leapfrog over salespeople, it is critical to also form a relationship with the station manager. 4. Maximize your budget. We have a modest budget for buying ads. Rather than accepting the stated pricing and terms, we negotiate. If we are buying $200 worth of ads for one service, we negotiate another $200 worth of free ads to promote something else. This is the same practice that most large corporations and small-business owners use. A bonus to purchasing some paid ads has been the amount of in-kind support we have received in return, which far exceeds the amount we spend. 5. Explore available technologies. Although it helped that CADL already owned video equipment, the advancement of mobile devices and cameras has made this a viable project for anyone. And in many cases, the television or radio station can provide the production as part of an agreement. Trenton Smiley is marketing and communications director for Capital Area District Libraries in Lansing, Mich. He has an M.B.A. from Baker College and more than 15 years of library marketing experience. His email address is smileyt@cadl.org.